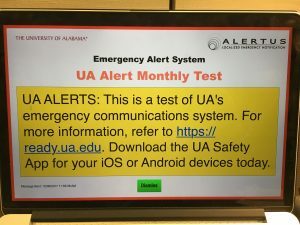 On the first Wednesday of each month (unless inclement weather is expected), the University tests its emergency notification systems, including UA Alerts, the public address system and digital signage. In addition to notification tests, the University provides monthly safety tips and information to help the UA community be prepared in different types of emergency situations. This month, you are reminded to make sure your contact information on myBama is updated so that you can receive all UA Alerts. Instructions on updating your contact information can be found here. You can also receive information about emergency situations on campus, including severe weather, by downloading the new UA Safety App for IOS and Android devices, and by following @UA_Safety on Twitter. When an emergency affects campus, Alertus Desktop Notification software sends full-screen, pop-up notifications to computers connected to the UA network. The Office of Information Technology has placed Alertus Desktop Notification software on most new OIT-supported computers, as well as some older reimaged machines. Departmental IT staff have also added the software to computers throughout campus, including in some classrooms and computer labs. If your computer does not yet have Alertus Desktop Notification software, you can download it by visiting the Tech tab in myBama, going to the OIT Services window and scrolling down to Alertus Desktop Notification.